It’s that time of year again when allergies are hitting. 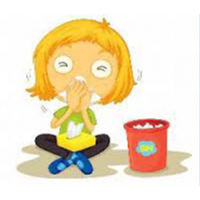 Many children suffer from allergies or asthma, the third most common medical diagnosis in children. How do allergies affect your teeth? Allergy and asthma medications (steroids and antihistamines) are often designed to dry out a child’s mouth, sinuses and airway. Generally they are very effective and reduce many of the side effects from allergies and asthma. Unfortunately the most common negative side effect is causing a dry mouth. The bacteria that cause gingivitis and decay thrive in dry conditions and thus we see these problems much more frequently in children on allergy and asthma medications. If your child receives daily or regular medications for allergies or asthma then we recommend they increase their brushing frequency. It is especially important that they brush right after taking these medications. This may help prevent the negative side effect of cavities.